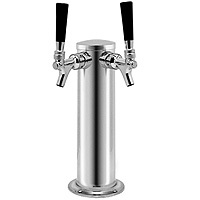 This is a Kegco D4743DT Chrome Plated Metal Single Column, Double Faucet, 3" Diameter Draft Tower. This tower comes complete with two chrome-plated faucets and two separate 5' lengths of 3/16" clear beer tubing with nozzle and hex nut assemblies. It will connect to all standard keg couplers. Comments: We are small bar, and recently bought the two tap towers giving us a total of (4) beers on tap. We are very happy with the performance of this product.